MR. PEABODY and SHERMAN, the smartest dog in the world and his boy, are hosting the zaniest late night talk show on television in the all-new DreamWorks Animation original comedy series “THE MR. PEABODY & SHERMAN SHOW.” In the first animated talk show for kids, Mr. Peabody and Sherman take late night television to a hilariously new level, set in their swanky penthouse apartment atop beautiful Templeton Tower. Complete with a “live” studio audience, special guests, and plenty of lights, camera, action, music and laughs, kids will be cracking up the moment Mr. Peabody and Sherman hit the stage. Looks like the Lady of the Land isn't such a lady after all! Catch Cleopatra and all of her vulgar behavior on The Mr. Peabody and Sherman Show! 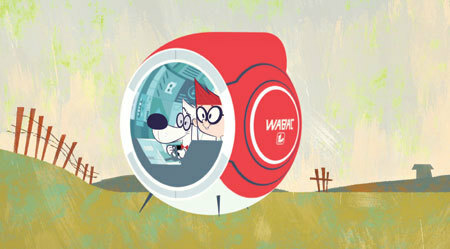 “THE MR. PEABODY & SHERMAN SHOW” really is two shows in one, as Mr. Peabody and Sherman always leave their talk show set to take viewers back in time via Mr. Peabody’s WABAC (as in, WAY back!) time travel machine. While crisscrossing through history, Mr. Peabody and Sherman encounter iconic figures who are bent on accomplishing anything but what they’re known for, leading to some of the show’s most memorable and laugh out loud moments. Kids will never view the past the same when Mr. Peabody and Sherman are involved in the least accurate, yet most hilarious, moments in history. 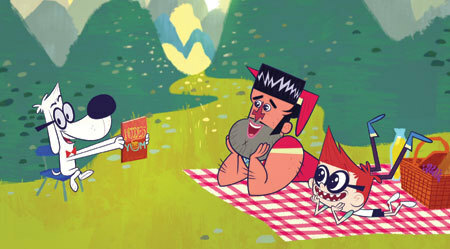 While traveling through time is a thrilling adventure, the show must go on and Mr. Peabody and Sherman always get back on set to host musical acts and special guests, as well as unwanted visits from their wacky neighbors like, Christine, who will stop at nothing to becoming a star, or the yuppie Yakamoras and their flatulent infant, Baby Kenny. The talk show may not always turn out the way Mr. Peabody envisioned it, but the outcome is always fun! 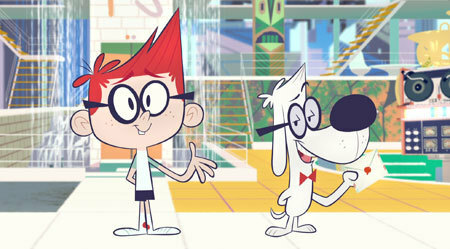 Who is your favorite character from Mr. Peabody and Sherman?